Tottenham manager Tim Sherwood has admitted that he does not know his best team because so many of his players are "much of a muchness". Sherwood said that goalkeeper Hugo Lloris and striker Emmanuel Adebayor stood out as exceptions, with Christian Eriksen just behind that pair. "I have assessed the players more than anyone. I could not tell you the best 11 players at Tottenham," he said. "They're are all so similar, much of a muchness regarding the same quality." Tottenham, who face a London derby against Fulham at White Hart Lane on Saturday, have won only two of their last six Premier League games, dropping to sixth place and slipping out of contention for Champions League qualification. Sherwood says in-form Danish midfielder Eriksen can't be left out of his side at the moment, unlike many of the club's other signings from last summer, who have struggled to make an impact. 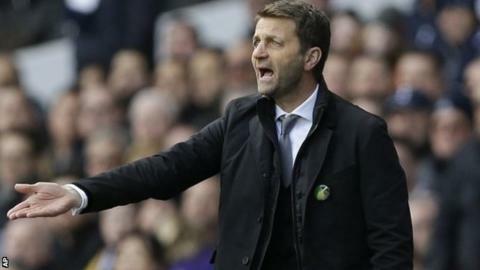 But Sherwood, whose own long-term future is uncertain following his appointment to replace Andre Villas-Boas last December, believes they will come good. He highlighted the fact that club-record buy Erik Lamela, signed for £30m from Roma, and midfielder Etienne Capoue, brought in for £9m from Toulouse, have had debut seasons interrupted by injury. "All of them will be better, without a doubt, because they will have had a season in the Premier League," he added. "That's the ones who have played. You need to have a certain amount of games. "Probably Erik and Etienne have not played enough but they will have benefited from a year in London and their language will be better and hopefully they can settle on the pitch. "But the rest of them will all be better. All can improve."